Hang this large whimsical glass globe terrarium / candle holder with a hook or with string for a unique home decorative accent or as a perfect glass ecosystem for your house plant. 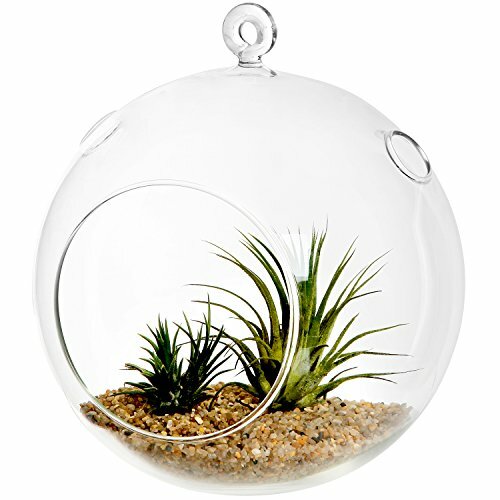 Perfectly shaped and sized for air plants, sand, moss, tea light or votive candles. No matter how you choose to use your glass wall bubble terrarium, it will enhance the appearance of the room where you place it. Be creative with these fun terrariums. Use a single terrarium or arrange a group along your wall or hang to create an amazing illuminating light or garden display. Plants / votive not included. Display this beautiful 7" glass globe terrarium to instantly change the look of any room.